Here's one with a hand colored image but who drew it or when I have no idea. It was in one of my clip art files and had no identifying information. If you recognize it, or know who drew it, please leave me a comment and let me know. I'd love to give proper credit. at Color My Heart Color Dare. I used ProMarkers to do the coloring and added glitter to the angel's wings. After it dried, I cut the image with an oval die from QuicKutz, then wove white, satin, ribbon through the holes in the outer edges. I tried putting the image onto embossed white CS thinking it would make a great white-on-white card but, instead, it just got lost. So I switched to a light blue CS, ran it through my "Linen" embossing folder for a bit of light texture, and added the image piece to it. The sentiment is printed and hand cut. I didn't think the card needed any additional embellishment. You have a wonderful style and I can guarantee she's going to love all three of them - and probably want all three too! This one is so lovely. I love the way you did the ribbon. Just beautiful. This is beautiful, love how you have threaded the ribbon through the frame. Such a beautiful card. The threaded ribbon is beautiful. Thank you for sharing with us at Creative Inspirations, good luck and I hope you will join us again. Lovely angel of joy. I really like the placement of the oval threaded with ribbon. Thanks for playing with us at Time Out. So pretty! I love how you looped the ribbon around your angel. Thank you for playing with us at Color Dare! Beautiful! 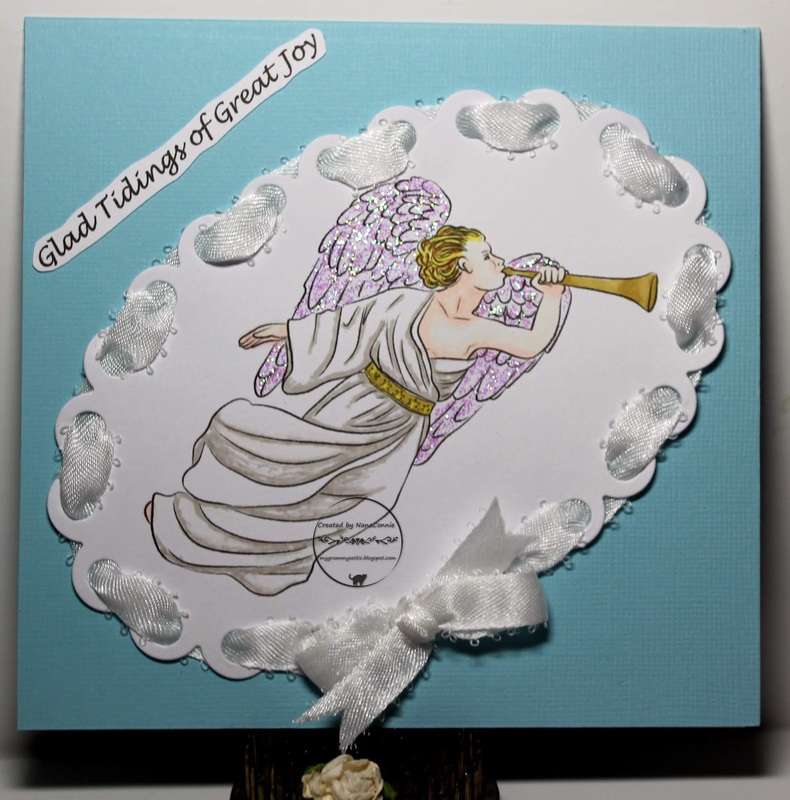 I love the sparkly wings on the pretty angel and the ribbon threaded through your card is perfect! great job! love how you have weaved the ribbon! thanks for sharing with us at Quick Quotes this month. What a darling image! I love the way you weaved the ribbon around the edges. SO pretty! Thanks for joining us in the challenge at Scrapy Land! I love the weaving of the ribbon. I will have to remember that technique! Thanks for sharing your talent at the CMH Color Dare challenge. 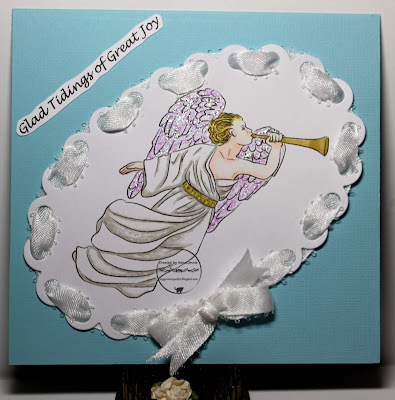 I collect angels and this card is wonderful with the angel image. The ribbon weaving is a pretty touch! Thanks for joining us at Quick Quotes! Beautiful card! 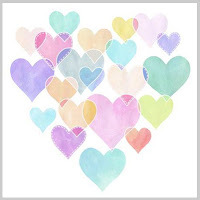 Thank you for joining us at Color My Heart Color Dare Soft and Pastel Challenge.